For the last while I’ve had this blanket project on the back burner. It was meant to be a straightforward spinning project. Spin the warp for a handwoven blanket. The fibre, while clean was a bit sticky so it had to be rewashed. Then it needed to be carded. I originally thought to comb it, but really wanted this blanket in my lifetime. So onto the drum carder it went, as you can see below. For warp you need a strong yarn, so worsted spinning would be best. But as it’s a blanket I also wanted it to be soft and warm, so wanted a bit more air in the yarn. After some sampling that I noted in the last post I used a short forward draw that I let the twist into it, so it’s a modified woollen draft. And it didn’t smooth the yarn at all while spinning. Just pinch, draft out, let go. Repeat a million times. In the next couple of photos you may just be able to see how fuzzy the yarn is. 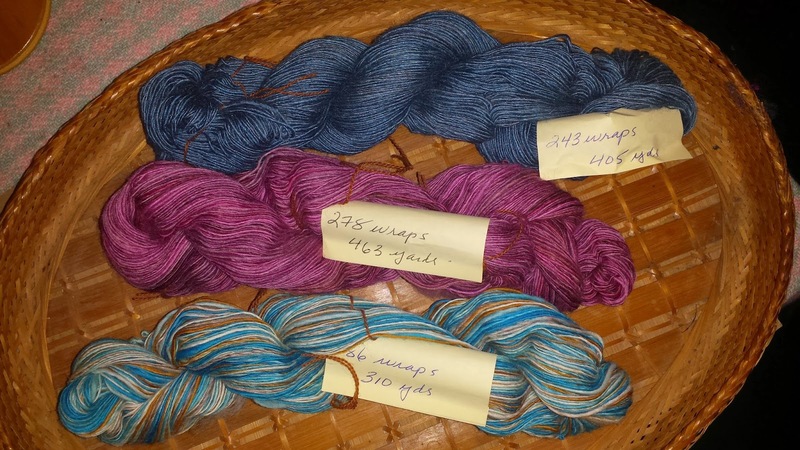 And here are three newly plied skeins totaling about 740 m of two-ply yarn. I haven’t washed them yet. I plan to spin it all up and wash them all at the same time. Now that Fibres West is over an my workshops are behind me, I can devote all my time to this project. 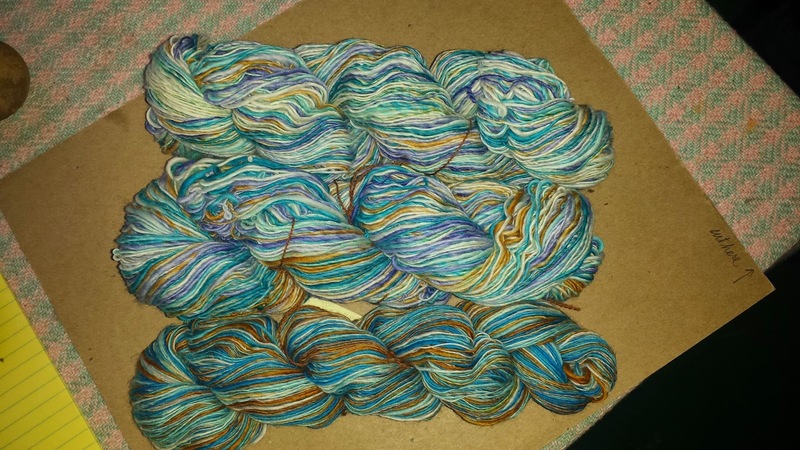 This entry was posted in spinning, woolen yarn on March 21, 2015 by DianaTwiss. Ginette and I decided to collaborate on a fibre arts project. She’s the weaver and I’m the spinner on this project. A client of hers wants a hand woven blanket that is white, soft and uses a good amount of local fibre. So we went out to Ann’s place. Ann has many sheep. Not only does she have many sheep, but she treats them well so their fibre is lovely, soft and top quality for spinning. We came away with these two bags of Ramboulette/Targhee cross. It’s 3.5 lbs and it’s already washed. BONUS. It is in two bags because the locks in one of the bags has the tips cut. Even better. Ginette has some wonderfully soft alpaca that she wants to use as the weft, so what I’ll be spinning is the warp. With that in mind, the first thing I sampled was combing it and spinning it worsted. The yarn that resulted was nearly perfect worsted yarn. Strong, lustrous, and smooth. But combing takes time and produces waste. I wanted to know if I could produce a worsted type yarn, but with a faster preparation technique, like a drum carder. So the next experiment was to drum card the fibre and spin the batts worsted. Here’s my set-up for making carded batts. What you see below are my tools and equipment. From left to right are the brushes, doffers, carding board and drum carder. I get the fibre ready for the drum carder by teasing it on the carding board. Just a few passes with my hand cards and it’s ready for the big machine. See how it opens up the fibres and gets them ready for the drum carder? This saves tons of time. I used to this teasing lock by lock. It got rid of more straw and bits, but it took a lot of time. Once I have teased up about an ounce of fibre, I start putting it into the drum carder. Nice and slow. Little layers at a time. The fibre was so clean I only needed two passes on the drum carder. For that first sample using the carded preparation, I spun with a short forward draw (worsted) and smoothed the yarn as I went. I was aiming for the same thickness as the weft yarn. From top to bottom: 1) combed/short forward draw; 2) drum carded/short forward draw with more twist in the ply than in the next sample; 3) drum carded/short forward draw with less twist in the ply than sample 2; 4) drum carded/short forward draw but I let the twist into it, so it’s a modified woollen draft; the sample below the pen is drum carded/long draw. It was a bust – horribly uneven, but I included it the show and tell anyway. Even though I was focused on making a worsted yarn because that’s what I thought was the best thing for warp – the woollen yarn that I made ended up being the yarn of choice. While we like all the yarn produced, for this project we decided on sample 2 – the woollen sample. It is strong enough to be used as warp – but it’s light and soft, matching the weft yarn better than any of the other samples. It is also faster to spin than the other samples. BONUS. So I need to card and spin 900 yards of two-ply yarn. If I want a blanket of my own, I just need to spin up another 900 yards. This entry was posted in alpaca, drum carding, handspun yarn, spinning, woolen yarn on January 26, 2015 by DianaTwiss.